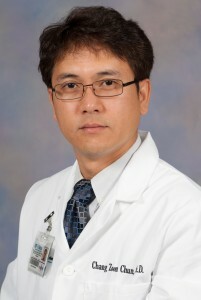 Dr. Chun received his B.S and Masters from Pukyung National University and received his PhD from the University of Connecticut with Dr. Thomas Chen. He stayed on in Connecticut to do a postdoctorate. He then moved to Medical College of Wisconsin to do a second postdoctorate with Dr. Ramchandran. He is investigating the role that a phosphatase, Dusp-5, and kinase, Snrk-1, play in blood vessel formation. He will be continuing his work on vascular development. Please click here for a list of Dr. Chun’s industry relationships.